It's Friday - three days after the ice storm. I have to work today and this weekend. Not much has changed since Tuesday. The damage to the trees and lines will be normal scenery for a few days. Fog, freezing fog when I arrived and then it was pretty when the sun came out shining on all the damage. 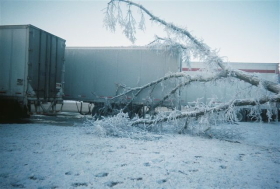 Not that the damage was pretty, but the wonders of nature and all that glistening ice crystals and ice too. The lines were so low I barely cleared them and had to do that in the opposite lane at times. It should not be this difficult moving trailers among 3 lots! The 4-wheelers had no clue as to why I was in the wrong lane & I had to watch my right side so they wouldn't take that space. During the morning I worked on 2 trailers that were stuck/frozen to the ground. We really could use them if at all possible. I hook up to them and keep trying to move them in between moving the other trailers as needed. One is in the dock that faces north and that is the worst one. When walking on the ice, the thaw is going on under it, but not enough to free the trailer. Plenty of water on the top and it is very slippery. Can't make any headway forward and I can't back up since I'm in the dock. A thick layer of ice on everything! The other trailer is in the back lot. Nothing to block the sun's rays here. I'm able to rock the trailer, but there is too much ice around those tires. The puddle it was parked in was pretty deep. I move to another trailer and I'm able to get it to move from the frozen ground. The landing gear pads have earth frozen to the bottom now-- about 1/4 inch. I bring the earth with me to the dock. After lunch I work on the trailer in the dock again. I am able to go forward about 6 inches. I backup to the dock and I repeat this process several times with each time making it a little farther away from the dock. Because I am on ice, I have my power divider on for better traction. About 10 minutes later I have removed the trailer from the dock! I won this battle. The rest of the day was easier due to the thawing so most of the trailers were ready and willing to be moved. I was also happy to not deal with stuck brakes and frozen air lines. Even the trailer doors and hooks were much easier to deal with today. Some needed attention with my hammer but all in all it was a much better day than Tuesday.